The group, an affiliate of Al-Qaeda, said on its Twitter account that the “invasion of the Iranian cultural center’ was in “retaliation for Iran's party fighting along the criminal regime in Syria,” probably referring to Lebanese Hezbollah. 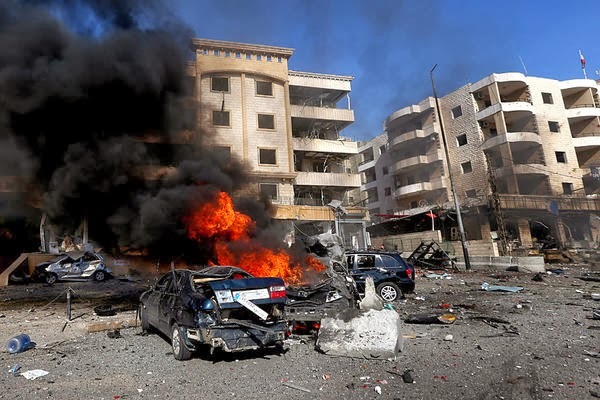 suicide bombing is a disgusting practice that was introduced to Lebanon through the efforts of the murderous Khomeini. And Khomeini's mob are receiving back with added interest. YOU CAN not force your way into paradise by killing,maiming,and taking innocent souls!. can not PRETEND to follow the noble teachings of the HOLY prophet that himself lived peacefully with virulent enemies,dinned with non Muslims,lived in peace with pagans ,himself humiliated and escaped numerous attempts on His life,would risk HIS life to save a tormented soul. CAN not afford to call yourself -'AHLUL Sunnah',or a perfect Muslim when you rebel against the teachings of the Holy prophet .The prophet whom the ALMIGHTY calls him the mercy upon mankind. instead of killing innocent souls-WHY not travel to QUM and engage in a debate, argue your case with fellow scholars so as to reach a consensus as the HOLY Prophet [P.B.U.H]directed INSTEAD OF SHOWING TO THE world- un Islamic barbarity !.